Japan is an island country in East Asia. Located in the Pacific Ocean, it lies to the East of the Sea of Japan, China, North Korea, South Korea and Russia, stretching from the Sea of Okhotsk in the North to the East China Sea and Taiwan in the South. Japan is an archipelago of 6,852 islands. 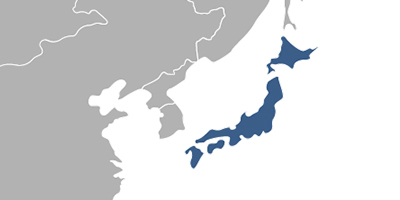 The four largest islands are Honshu, Hokkaido, Kyushu, and Shikoku, which together comprise about ninety-seven percent of Japan's land area. Japan has the world's tenth largest population, with over 126 million people. Fees associated with registration of IP rights in Japan are available in the fee calculator.